Welcome to my tutorial on drawing hillshade. This post is for people who want to draw map hillshade with pencil/graphite. In an upcoming post, I’ll describe drawing true hillshade on a complete map (with labels, roads, etc). Other upcoming mountain-drawing posts will include pen-and-ink and colored pencil. 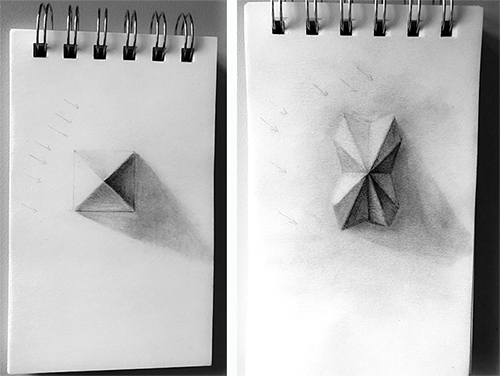 For now, this post is a tutorial for drawing with your graphite pencils. I’ll present some fundamental steps that should get you on your way to being a pro hand-drawing hillshader. A friendly recommendation to all you graphite art enthusiasts: Drawing at your best requires getting into the flow. Reading through this post, and then doing some warm-ups (some listed at the end of this post) is a great way to get into the flow of drawing hillshade. 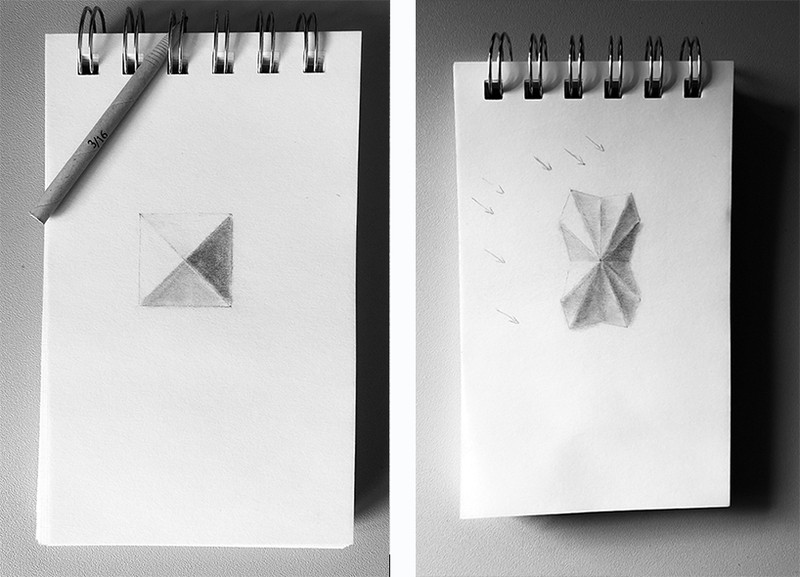 Warming up will help you get acquainted with the paper and graphite you’re using. Music helps too! The description of each step is accompanied by a time-lapse video of me demoing the step. In the videos, you can follow along as I sketch the area around Mount Everest captured in Imhof’s hillshade. I also incorporated photos of my sketch of a ridge along the Knik Glacier in Alaska, showing the static results of each step. Below, you’ll find a extended video of this Alaska drawing as the second-to-last item in this post. The reference for this second video comes from a digital hillshade image that I created from a DEM using GIS software. In Step 1, (Choose a Reference Photo) you can download this image as a reference photo, along with some others if you like. Pencils. If you’re incorporating hillshade into a map with other information (labels, cities, etc. ), you might want to use pencils on the lighter end of the scale. When drawing just the hillshade, I like to use any pencil ranging from 2B to 6B on the the HB graphite scale (sometimes up to 8B if I’m feeling super shady). I’ve drawn entire hillshade landscapes using only the 2B, but the 3B to 6B are so great for blending the smoother areas. Faber-Castell is my go-to pencil brand. I find them to be quite smooth. Staedtler pencils are also good. Paper: Get a good sketch pad. Get a few with various weights and textures, in fact. Always experiment with the paper to which you are committing your final project. Graphite blends differently on various paper types. Blending Stump(s) and tortillon. Everyone is going to have a different drawing style. When I draw, I use the tortillon a lot. You’ll find it really useful for the gradients when your drawing hillshade. While there is a difference between blending stumps and tortillons, this post will use them interchangeably and let you choose which you want to use (both the term and the tool). While you will vary the pressure, I use medium-to-slightly heavy constant pressure when using the blending stump (and tortillon). The thicker the paper, the more pressure I usually use. Erasers. I use a high polymer eraser and a kneaded eraser. The high polymer gives a nice clean slate in the spots you’re erasing, and the kneaded eraser is great for smudging off graphite to lighten up spots without removing all the graphite. Kneaded erasers can also be formed into narrow shapes for erasing small areas and finer lines. Sometimes, I will use an exacto knife to slice off a narrow piece of high polymer eraser for these fine-line erase jobs too. To trace or draw freehand? When practicing this technique, I like to draw freehand. It’s really great practice for getting accustomed to drawing from real-life references. Freehand also helps train your mind for how to draw from the imagination. However, when it comes to final drafts of real landscapes, for example a map of a real space that I want to put out into the world, I will likely perform Step 1 by tracing the ridges on a light pad, light box, or on a computer screen (super gingerly to protect the screen!) So, while you’ll see me drawing freehand in the videos, just know that you don’t have to do this. In fact, Step 1 for the Alaska hillshade that I demonstrate was traced from my computer screen. BUT! All other steps after sketching the ridgelines do not need to be traced. In fact, it is recommended that you do all other steps by freehand while using an image as the reference. Paper over a light pad is going to hide all of the luscious nuances of light values. You’ll never be able to capture the landscape’s drama by tracing your whole way through it. Make one. If you’re into making your own digital hillshade imagery, you could use one of those as your reference image. In fact, my upcoming post on the complete map method does just that. Search for one. An internet search for “hillshade” or “hillshade + name of area you want to draw” returns a lot of images that are perfect for using as a reference. Also “shaded relief” is a good search phrase. Filtering for black-and-white images helps narrow the search sometimes. Download one (here’s some). You can download these images I made using some GIS software. *Note – If you are using an image made from a DEM as your reference image, remember that these can oftentimes show a lot of extra data in the landscape. It is ok to generalize to the predominant gradients and values along the landscape where DEMs may have a little too much detail. 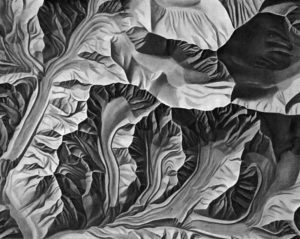 It can be helpful to start your shaded relief drawing journey with a great reference photo of a steep area that has some significant relief (a lot of elevation difference between the peaks and valleys). The reason I find this helpful in the beginning, is that steep areas allow for a lot of shade, so they will have a lot of different light and dark values you can work with. A scale of 1:100,000 or larger (larger scales: closer to the Earth) is a little easier to start with as well. The smaller the scale (farther from the Earth) the more ridges and valleys you’ll have on your page. It’s nice to start with something less challenging, but I also know how fun a good challenge can be! Remember, you don’t have to start by drawing the entire landscape in the photo; you can focus on a few ridges as a warmup. Here are three magnificent maps with gorgeous hillshade. Each of them has areas of distinguishable relief, which makes the lighter and darker areas easy to identify. From L to R: Imhof’s Everest map; S. F. Emmon’s Topographical Map of Mosquito Range; Imhof’s hypsometric & hillshade map of Rheinwaldhor-Biasca, 1963. You can find the entire PDF of this atlas here. This step is optional, but it’s a nice trick when you’re just practicing: De-saturate all the color from your reference photo. My approach when starting with hand drawn shaded relief was to use a black-and-white image as my reference photo. 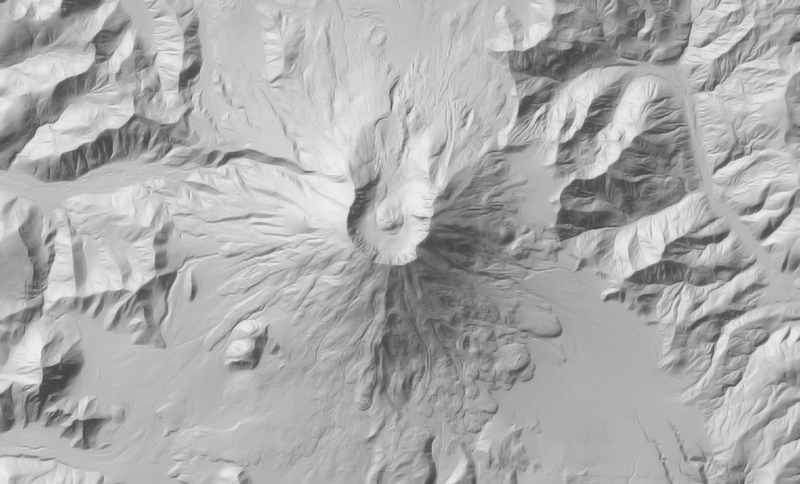 The reason is that all shaded relief really is is the difference between light and dark values on a page or screen to give the illusion of elevation relief. When making graphite art, the appropriate use of light and dark values is what makes a drawing realistic. It sounds like an oversimplification, but it’s true! You can get the right values in a variety of ways: pencil pressure, erasing, smudging, smearing, blending, hatching, scribbling – really any style you want to use to make the brighter areas brighter, and the darker areas darker. Back to the original point of this paragraph – Black-and-White reference images. When beginning this journey of hand-drawn hillshade, I found it a lot easier to see the difference between light and dark values in my reference photo if I was using an image without color. Luckily, on page 339 of Imhof’s Cartographic Relief Presentation (2007. Esri Press), there’s an image of just shaded relief for his Everest map, which I’ve included below this paragraph. This is the same area from the map above-left. Take a moment to study this photo. It is a beautiful placement of light and dark values to give the impression of mountains and glacial valleys. There are no harsh lines. The ‘lines’ you see along the ridges are just an illusion provided by darker slopes’ adjacency to lighter slopes. Understanding that key point is fundamental in drawing hillshade. Notice how dark those southeast facing slopes are! The richness of this particular image is the reason I was so drawn to it for one of my first hillshade sketches. 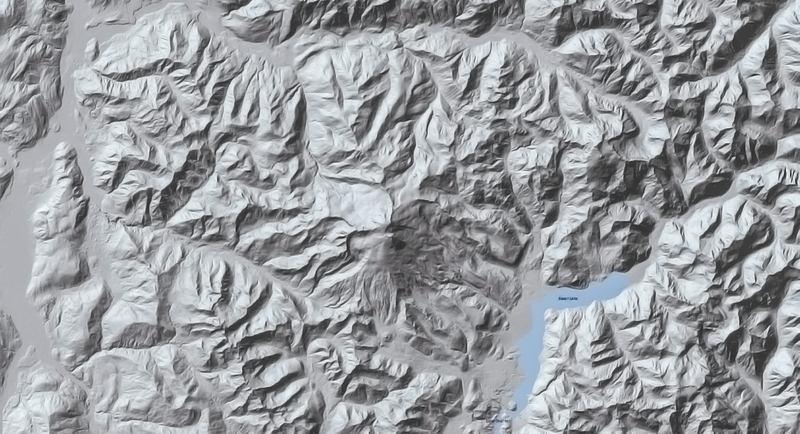 If I were to draw a hillshade as part of a map with other information, like labels, buildings, glaciers, lakes, I might want to ease off on the darkness so that the other information could show up well. It really is about the lights and darks! 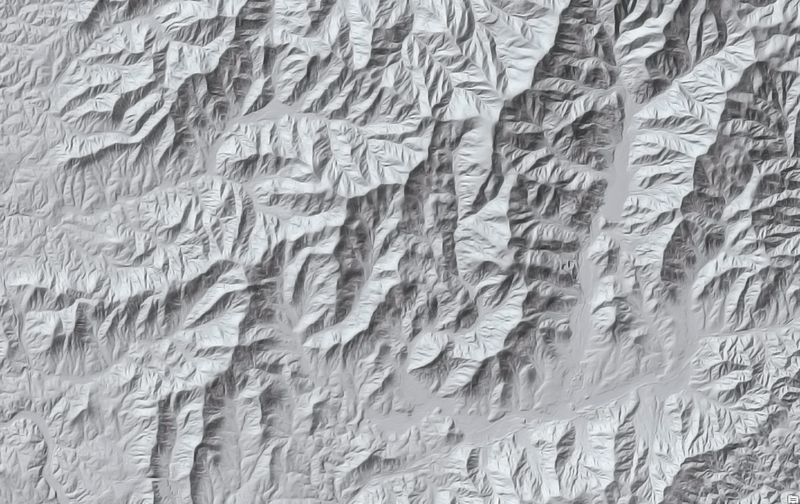 It’s implicit the name, really: hillshade; shaded relief. You’re basically creating an impression of elevation by adding shade to the areas where less light can reach. Take a moment to identify the direction the light is shining in your reference image. The light source on almost every shaded relief that you’ll see comes from the upper-left/northwest. In fact, there’s this weird phenomenon that happens when you switch the light source from upper-left to lower-right – or of you rotate a shaded relief image 180 degrees – the high areas look inverted. 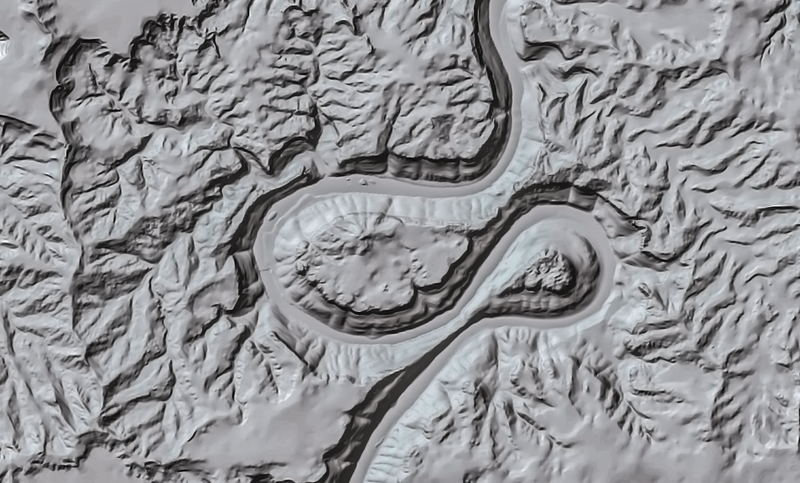 The two following shaded relief images of Mount Saint Helens are identical. The one on the left was rotated 180 degrees so that north is at the bottom of the image, while the image on the right has north at the top. Notice how the stratovolcano on the left image appears to be sinking into the earth instead of rising out of it, like the image on the right. Also, the left image’s valleys look more like ridge tops. It’s a neat optical illusion. Check it out! These images are identical. I promise. These are identical shaded relief images of Mt. Saint Helens. On the left, the image has been rotated 180 degrees so that south is at the top of the image, and the light source is at the lower-right. Notice this orientation gives the image an inverted look – as if the mountains sink into the earth like canyons. On the right, north is at the top of the image. With the light source in mind, investigate all the nooks and crannies of your reference photo. This is a sort of warm-up I like to do when drawing hillshade. Sometimes we draw what we think should be there instead of what the still life, landscape, model, or any other reference is telling us. Where do the darkest shadows collect? Where do the brightest parts of the slopes shine? Also check out the gullys, valleys and plateaus. Understanding the light’s behavior along the landscape you’re about to draw is key to getting a great impression of what’s really there. And yes! It is an impression. So 100% perfection is not required. But your peaks, valleys, rolling hills should correspond extremely closely with your reference, especially if you’re making a map to be used or viewed in the wild. Although, I’m also a fan and creator of fake maps, fantasy maps, and maps inspired by – but not based in – reality. And hillshade in those maps are rooted partially or fully in the imagination. But you’ll even need to account for the light’s behavior – albeit imaginary – in those landscapes to make them look like mountains. Purpose of this step – In this step, you’re basically drawing the framework upon which the subsequent steps will be based. These sketched lines will “disappear” soon, as the image starts to take a more physical form while you continue to sketch and blend. 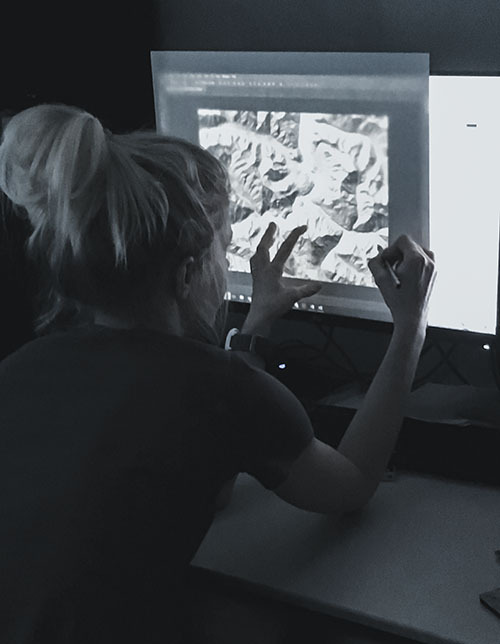 Pressure and Pencil Choice – After investigating the light source on your reference photo, the next step is to lightly sketch the ridgelines – or divides. I like to use a #3B or 4B or higher pencil. Since you will eventually blend this sketched line with your stump, you’ll want to sketch lightly. The #2B is nice for blending, but I find that the increased softness in the #3 makes this a little easier. You could use a #4B or darker, but just know that it is always easier to go darker later on, and more difficult to go lighter. Sketch the ridges & divides. Start with the most prominent ones. In this time lapse video below, I’m sketching most of the prominent ridges from Imhof’s shaded relief image. While I’m doing so, I’m keeping in mind that these ridges are going to simply serve as guidelines which will divide light and dark values – that is to say these ridgelines are not the drawing, but rather they set up the framework by which you will shade. So, the pencil pressure should be very light. I’m also faintly sketching in some of the lines where the dark and light values diverge in the valleys, but mostly this step focuses on the ridges. The ridge along Knick glacier after I sketched the ridges via tracing. This will be the only step that tracing will occur (if at all); the remaining steps are freehand. This image also includes some lightly shaded areas I did while sketching the ridgelines. More shade added in the next step. Notice how faint the sketched ridges are. Although the images in this tutorial each have prominent ridges, the concept holds true for gentler landscapes as well: Draw a faint line along the highest crest that follows the length of your hills, mountains, and cliffs. Note that in gentler more rounded landscapes, you’ll eventually blend this sketched line, so draw faintly. Purpose of this step – The objective for Step 2 is to get some graphite on your page so that you can blend with your blending stump in Step 3. This shading step will start to give your drawing some depth as you add graphite to the general areas where the predominant shadows fall. As explained below, the shading for this step should be kept pretty tight against the ridges and features where the shade/shadows begin, since this is usually where shadows are darkest in shaded relief (or so I have found). 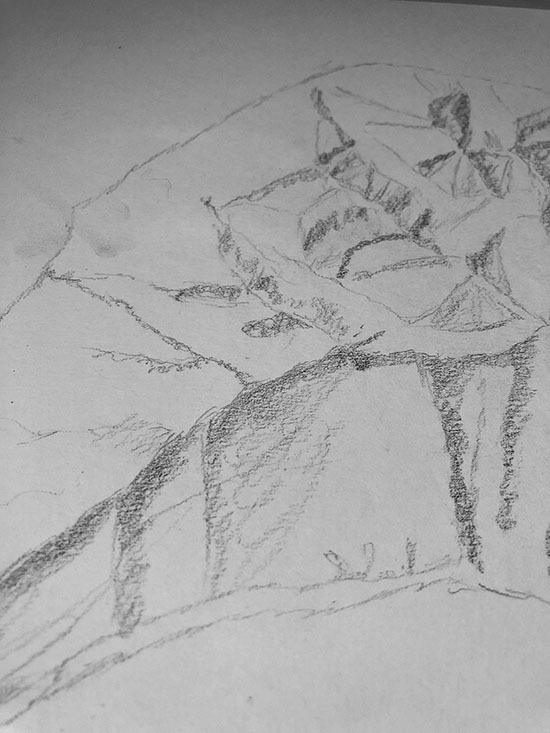 Pencil choice & pressure – Using a pencil ranging from the #3B-#6B start lightly shading in the landscape you just sketched on the sides of the ridgelines and hills where the shadows are cast. The pressure should still be pretty light. Tilting the pencil to use the broader edge (as opposed to using the tip of the pencil) will make the graphite easier to blend. 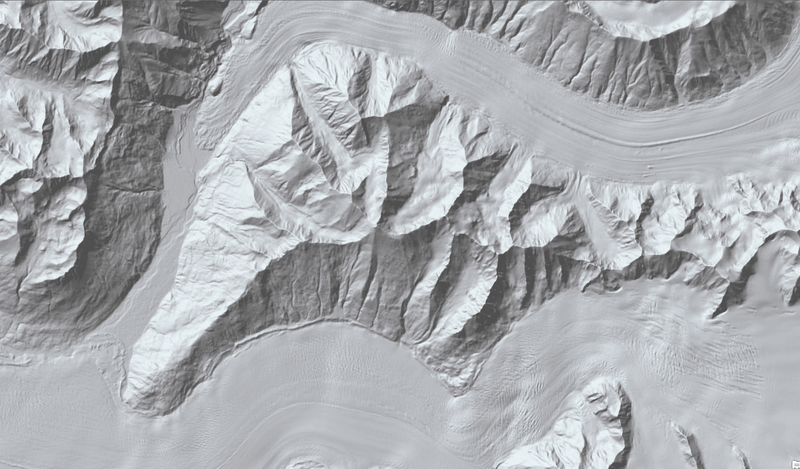 Alaska shaded relief: A closeup view of Step 2 (Shade the Shadows), prior to blending. The pencil pressure was pretty light, and was done with a 4B Faber-Castell. This combination of medium-to-light pressure with a softer pencil will make it easy to blend. Now we have a nice sketch going! Don’t be frustrated that what you have doesn’t look like a shaded relief yet. It will soon. You’re doing it right! Technique – This step is so rewarding because it is the one where your sketch starts to take the form of a true hillshade drawing. Take one of your blending stump tools (I’m actually using a Tortillon for all the drawings you see here) and start blending the graphite you just shaded in the last step away from the ridge in the direction that the shadow falls. If you’re doing a deep canyon, this is still the same, except you’d be blending away from the rim instead of the ridgeline. You will essentially be drawing with your stump by moving around the graphite. I blend in tiny little circle motions. You can scribble, drag, or back-and-forth, whichever works for you. Remember to be consulting your reference photo occasionally. Pressure – Test with various pressures. I find that I use a medium-to-heavy pressure when I blend. Don’t be shy when you blend; you can tilt the tool to get broader coverage. Now is also a good time to mention that I spend the majority of time using the blending stump/tortillon when I draw hillshade. It’s true. I’m blending or drawing with the blending tool more than I’m using a pencil. Remember to consult your reference image throughout this process. Try not to blend into the lighter side of the ridges, especially if the ridges in the reference photo indicate a sharp edge versus a gradual slope. If you do, you can easily erase it. In this video, I’m taking the blending stump and just blending those areas I shaded. Soft ridgeline drawing (Nifty Trick) – Much of my time drawing hillshade is with the blending tool. After you’ve been blending this dark graphite for a few minutes, you’ll notice that it will build up in your blending tool. This is GREAT! You can use the extra graphite that accumulates on the blending stump to draw in some of the minor ridgelines on the brighter slopes of the mountains. This is useful since brighter slopes’ ridges have a softer appearance, and drawing with the blending tool has an instant softness to it. Notice how far the blending stump can take that graphite you just put down in the previous step! The landscape is now taking form on the page. My Alaska hillshade sketch after the first blending phase. Although it isn’t complete here, it’s starting to gain some depth. Purposes of this step – This step is a lot like Step 2, but now you will focus on more details in your reference image, and transfer them to your drawing by shading. Take a good look at your reference photo. Where is it the darkest? How dark are those dark values? Pretty dark! I usually find that my drawings really start coming to life when I start getting dark. This doesn’t mean use a ton of pressure. But you want to try to increase the pressure ever-so-slightly. I use a light-to-medium pressure. Choose a #3B to #6B pencil. Maybe even a #7B or #8B if you’re feeling it. I used a #5B in the following video. Remember that you will blend all of this graphite. After studying your reference photo, start shading in the darkest areas where light has a hard time reaching. This will likely be against the ridges. 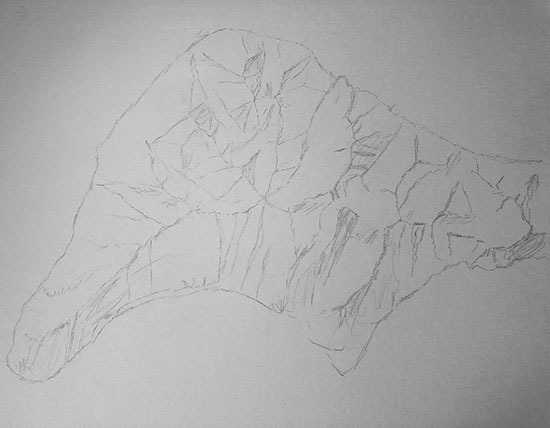 You will also use this step to begin shading in some of the minor ridges and the valleys that haven’t been added yet. In the video below, you’ll see me add a lot of new ridges that didn’t get added when I did Step 1 (Sketch the Ridgelines). I’m adding these as I frequently consult my reference photo. Getting these darker areas into the drawing really makes the higher areas begin to pop. Now get ready for some more blending. 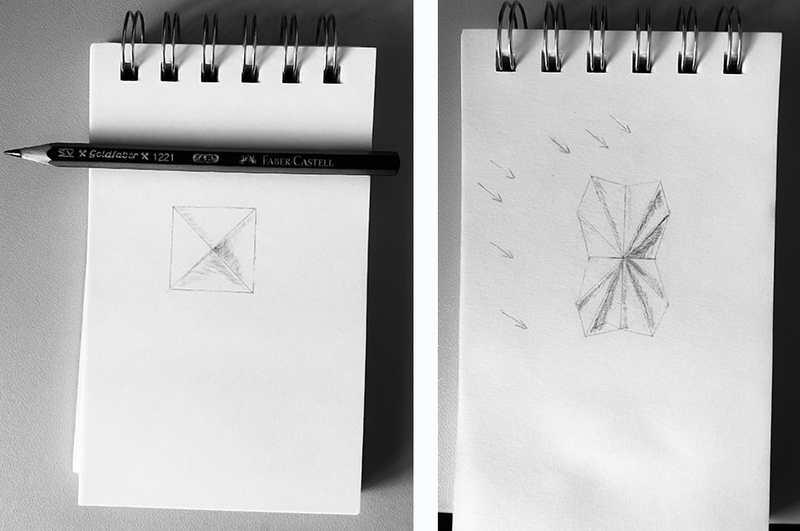 In Step 4, you just put down some more graphite on your paper with a pretty soft blend-able pencil. Now it’s time to blend it. Following the same principle from Step 3, use your Tortillon to blend all that graphite you just put down. Remember you can also draw with your Tortillion with all that extra graphite that you’re picking up as you blend. You can also continue to add those ridges on the sunnier slopes, where the shadows aren’t as harsh. Notice in the video above, I did a lot of drawing with my Tortillon on those sunnier slopes. I also used the extra graphite on the stump to fill in the valley floors. With all that shading and blending that you’re doing (nice work! ), you’ll find that some areas need to be brightened along the way. You’ll use the eraser to do this. Consult the reference image and compare it with your drawing to identify some ridges and slopes that might need to be illuminated. If it is a narrow spot, make sure you’re using a narrow polymer eraser or a narrowly formed part of your kneaded eraser. I didn’t get a long recording of myself erasing for highlights; this video was recorded as a time lapse, and then slowed down; the result is a little choppy. However, slowing it back down was necessary to show the technique more clearly. 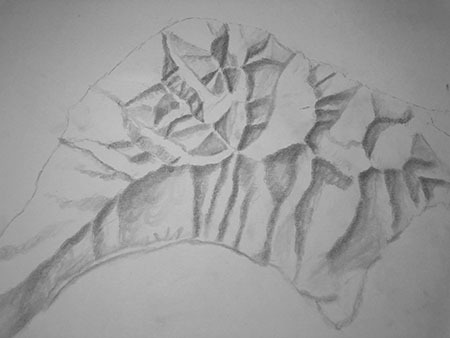 Now just keep shading and blending while still consulting your reference photo, paying attention to the light source, values, and forms of the ridges. The key throughout this process is to remain confident, and not get frustrated. Oftentimes the drawing doesn’t start looking like the landscape in your reference image until you’re well into the process. Drawing hillshade takes practice, and with each iteration you will learn more tricks and your own personal drawing style will emerge. Skip to the warm-ups below to get the hang of it. 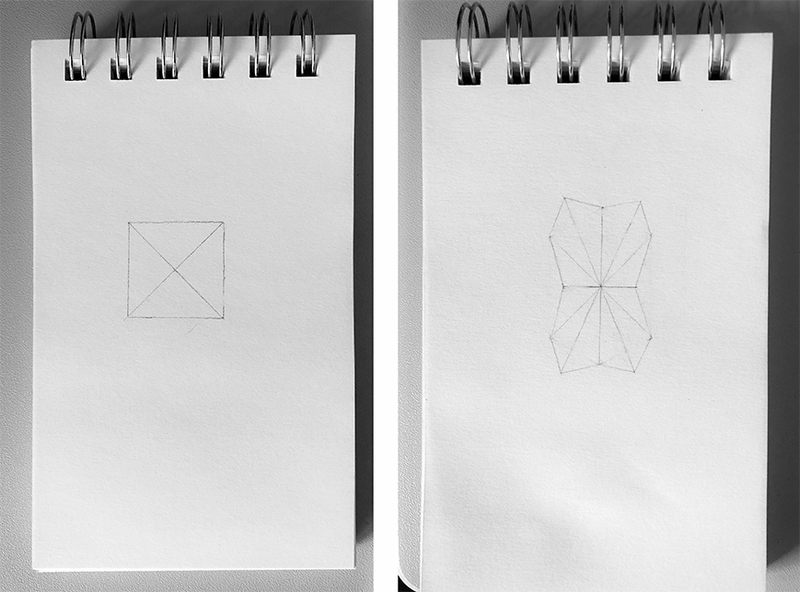 Draw simple shapes like the following, and test out the steps. Consider the imaginary upper-left light source as well. Sketch the ridgelines. Using simple shapes like this is a good way to warm up. Lightly shade in the shadier slopes along the divides. Petrichor Geoviz Studio © 2018 All rights reserved.